USA Trophy is a locally-owned company with over 20 years of experience creating personalized name badges, door signs, cubicle sign plates, and desk signs. Our name badges and signs are designed to be easy to read, attractive, and durable, making them ideal for executives, employees, salesmen, organization members, and anyone else trying to make a professional impression. To meet a diverse range of needs and budgets, we provide our clients with access to a large selection of name badges and signs and can customize them in house in any color, text, logo, or design. We offer silk screen name badges, plastic name badges, and brass metal name badges. Our silk screen name badges actually feature sublimation printing, which means that your name, logo, or other graphics will last as long as the name badge itself. 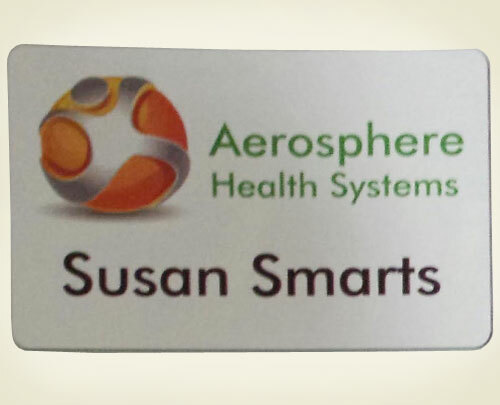 Our plastic name badges are a more cost-effective option and feature two colors engraved directly onto the plastic. Brass metal name badges are typically seen on members of the military or police force, but can be used by any professional. Our name badges are available in a complete range of colors, and can be attached with either a pinback, magnet, bulldog clip, or military clip. In addition to name badges, we also sell and customize door signs, cubicle sign plates, and desk signs. These are typically 2 inches by 10 inches and made from plastic. Let the professionals at USA Trophy help enhance your business in Orange County with our custom name badges, desk signs, door signs, and more. For the convenience of our customers, orders may be placed in person, by phone, or via email. If sending artwork, we recommend .eps to achieve the best results. Once your order is ready, the competed name badges or signs can be picked at our store or shipped to you. Our Laguna Hills showroom is open Monday through Friday 12:00 p.m. - 8:00 p.m. and on weekends by appointment only. We can also accommodate after-hour appointments and services, and are always reachable by phone, e-mail and fax. Most name badge/sign orders require a four-day turnaround.